With a degree in Clinical Psychology and a Masters in Clinical Research, Divya has worked with the Clinical Research Network for the past nine years. Divya’s fi rst role with the CRN was delivering commercial contract clinical research within a National Health Service hospital. 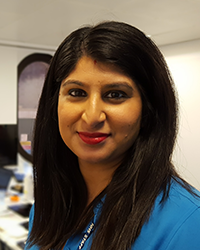 Prior to her current role, Divya worked as the Industry Manager within the Mental Health team, performance managing and maintaining oversight of the national mental health portfolio of studies. Thus, Divya has experience of clinical research from a site level and from a national perspective in the UK. Divya is also currently studying for a PhD in Dementia Care from the University of Birmingham.